Viswanathan Anand is clearly making a statement in the early stages of the World Candidates Chess tournament in Khanty-Mansiysk. The Indian crushed Shakhriyar Mamedyarov in a game where mistakes were not obvious but white’s position collapsed rapidly. 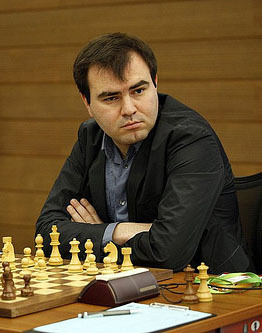 An off-form Shakhriyar Mamedyarov did not make a good account of himself in round three. Photo by FIDE.com. Black attacked white’s overextended center and weakened kingside to take the full point in 31 moves. Anand has surprised naysayers who thought that his competitive career was behind him. Maybe not! Probably the most exciting game of the round was Topalov-Aronian which exploded in the middle game, but ended in a three-fold repetition. Aronian sacrificed a piece for an irresistible attack, but Topalov returned material and held on to split the point. Peter Svidler is probably cursing himself for not snaring the full point against Vladimir Kramnik. There was a healthy post-mortem that showed white with winning chances. Kramnik was able to find tremendous resources with 45.e5! f5! 46.gxf5 and black found the saving grace with 46…Rf6!! This was to the delight of commentator GMs Peter Heine-Nielsen and Viktorija Cmiltye. Amazing! Not really much of a conversation in Andreikin-Karjakin as pieces melted away quickly and ended in a perpetual check.